After beating a civil suit for sexual assault in Los Angeles, Derrick Rose is playing basketball outside Chicago for the first time in his NBA career. You can’t blame Knicks fans if they are all waiting to see how long it is until Rose picks up his first injury. Thankfully, the Knicks have a great backup in Brandon Jennings. Looking at the great number of injuries that Rose has picked up over the course of his career, it is just a matter of time until they will need Jennings to step into the starting lineup. 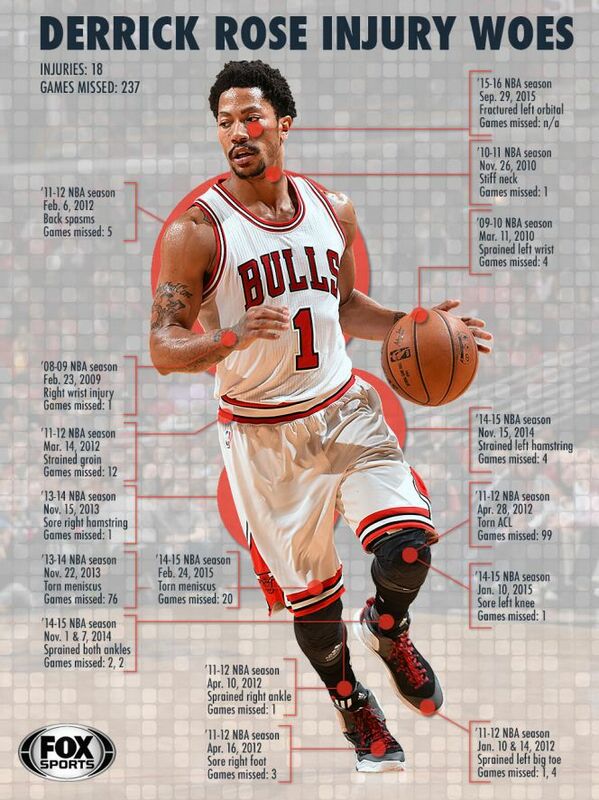 Here is a look back at the long, troubled history of injuries for Rose. This is the date that Rose missed his first NBA game due to injury. He injured his right wrist on a failed dunk attempt the previous night. He was drafted in June 2008, and this was the only game he missed because of injury during his rookie year. In his second year, Rose made the All-Star team for the first time. He also missed four games due to injury. After a collision with Dwight Howard of the Orlando Magic, Rose was knocked violently to the ground and sprained his left wrist. This injury kept him out for four games, and the Bulls lost all four games he missed. 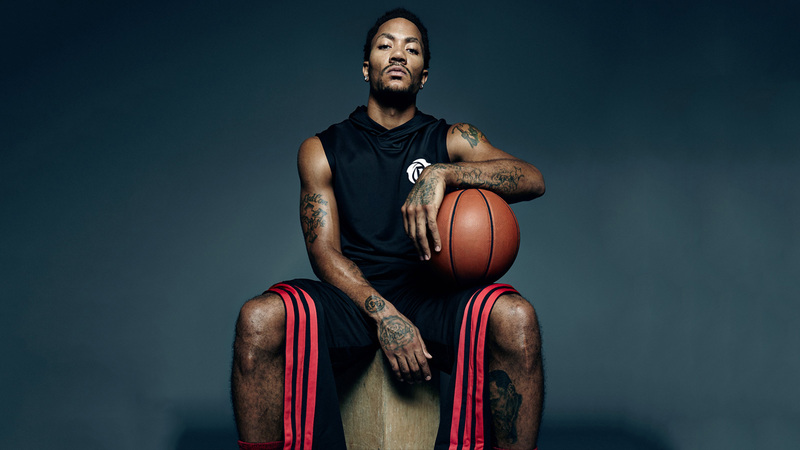 In his third year, Rose only sat out a single game because of injury. He had a stiff neck and missed a game that the Bulls lost to the Nuggets. This was the year that Rose was named league MVP, and Bulls fans thought they were on the precipice of another Jordanesque dynasty. Unfortunately, they were actually on the precipice of the Derrick Rose injury freefall. In his fourth season, the Derrick Rose injury situation began to be a constant concern for Bulls fans. His first injury of the year forced him to sit out a game against the Wizards with a sprained left big toe. He then played the next two games before sitting out four more games with another flare-up of his strained left big toe. At this point, the injury is deemed to be turf toe. A few weeks after his toe heals, Rose then misses five straight games due to a stiff back. This may have been when Bulls fans started getting a little antsy about his constant injuries. Rose suffers his third injury of his fourth season in the league. This is a big one. He hurts his groin so severely that he is forced to sit out 12 games. Rose misses a single game with a sprained right ankle. Rose picks up his fifth and final injury of the year. He misses five games with an injured right foot. This is the first devastating injury of his career. On a sharp cut in the Bulls’ first playoff game of the first round against the Philadelphia 76ers, Rose blows out his left ACL and dashes the Bulls fans’ dreams of the second-coming of Michael Jordan. Just six games into his comeback from surgery to repair his torn ACL, Rose sits out his first game of the season with a sore right hamstring. Just a week later, Rose suffers the second devastating injury of his career in as many seasons. In a game against Portland, Rose tears the meniscus in his right knee. He would need surgery and be out for the rest of season. In a very rare occurrence, Rose manages to sprain both ankles in the same game. He misses the next two games. He then comes back for two games before sitting out two more games. Rose sits out for four games to rest a strained left hamstring. The point guard sits out a single game with a sore left knee. For a third-straight season, the Bulls fans collectively groan when they hear that Rose has suffered a season-ending injury. For the second-straight year, it is a torn right meniscus that is the culprit. Rose is forced to undergo his second surgery to repair the meniscus. Rose sits out two games after spraining his ankle in a game against the Pacers. Right hamstring tendinitis forces Rose to sit out three games. The right hamstring flares up again, and Rose sits out three more games. After having his first long injury-free run in years, Rose misses two games due to a sore left groin. He went almost 11 months without missing a game because of injury. For the final time in a Bulls uniform, Rose sits out two games due to an injury. It is a sore left elbow. During the offseason, the Bulls trade Rose to the Knicks. Now, Knicks fans play the waiting game to see when his glass body manages to shatter again. Indeed, Derrick Rose may just be made out of glass. The tally of all his injuries and the time span serves as evidence. All kidding aside, we wish D-Rose all the best in the remainder of his career and hope these injuries didn’t take too big of a toll on his body and basketball game.